Batman takes a lot of blows to his head. These come from his fighting activities and from being routinely thrown—or leaping—onto or into hard objects like walls, floors, and moving vehicles. The issue of concussion in Batman’s career is something I addressed in Becoming Batman. In examining the scientific possibility of a human training to achieve the pinnacle of physical skill of comic book icon Batman, I reckoned him having a pretty short career. The main thing to shorten Batman’s career would be his accumulation of injuries, with concussion figuring prominently. In our own day and age concussion in sports—and particularly in hockey and football—has received considerable attention but little resolution. Is it simply because we cannot see it? Clearly, we can see the effects of concussion, but we cannot see the actual damage to the brain, the changes in energy demand and energy delivery and the disordered activity of neurons. Strong head trauma provokes a cascade that leads to an energy crisis—kind of a malevolent neuronal oxygen debt—that causes the neurons in the brain to fail (see diagram). The increase in energy demand coupled with reduced blood flow and reduced metabolism leads to the death of some nerve cells. In addition, neurons will take several days to recover from this massive shift of activity. The memory problems and mental confusion seen during the time after a concussion occur because of what happened at the cellular level. Returning to normal concentrations of neurotransmitters can sometimes take up to two weeks. 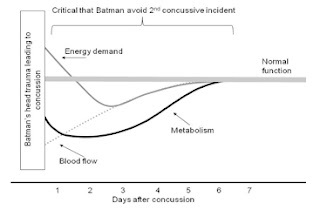 In a recent talk I was giving about the career of Batman I likened our society’s approach to concussion to be very similar to our approach to depression—that is, mostly ignoring it and downplaying the significant health implications. We have recently made good progress on raising awareness and removing stigma associated with depression but seem a good way off on making progress with concussion. This may have a lot to do with the fact that concussion is firmly enmeshed in the testosterone fueled machismo that dominates modern day contact sports like ice hockey and professional football. In this milieu, if blood isn’t streaming from a flesh wound—or better yet, a fractured bone actually protruding from broken skin—it isn’t an injury. No wonder concussion is seen often as a malingerer’s pretense to avoid the battle. With this in mind I wasn’t necessarily appalled by what I watched that Saturday night. However, it made me reflect once again on our propensity for paradoxical celebration of a cult of violence in our society juxtaposed with a clear denial of the implication of that violence. It is toward reconciling that gap that I can only hope we eventually turn. I personally do not see this as something to be made light of. 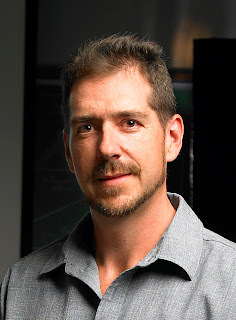 This is based upon my dual perspective as a neuroscientist (we are typically rather protective of the brain) as well as a martial artist with almost 30 years experience—including experience in full contact fighting. Squashing pumpkins on or after Halloween is one thing; permanent brain damage another thing entirely. Concussion is a real and present danger in contact sports like hockey and football. Just this week the Associated Press published the results of an informal survey of NFL players conducted in November 2009. The AP surveyed 160 NFL players about their experiences with concussion. The survey (see details here) included a mix of rookies to 17-year veterans and those playing all positions. Thirty of those players, that is, less than 20% of those interviewed, disclosed that they had either not disclosed or had trivialized their own concussions. In addition, half of the players indicated they had experienced a concussion and more than one-third of the players said the concussion had forced them to miss playing time. This information matches that from the Canadian Football League in 2000 where ~50% of players indicated they had experienced a concussion. It is now much more widely understood that the brain has tremendous adaptive abilities. The nervous system really does have a “plastic” ability to respond to training or to compensate for damage. This last part is critical because when we are talking about concussion the main point that must be understood is compensation which is really another way to say “repair.” A good repair means things still work well but does not mean things are the same as before the repair was either needed or finished. There is only so much repairing that can go on until limitations arise. These limitations should not be ignored or celebrated in Batman’s world or in our own. 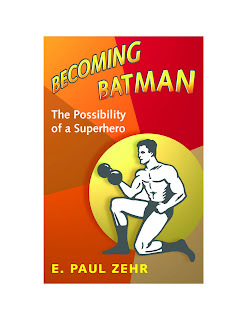 E. Paul Zehr, Ph.D., is Professor of Neuroscience and Kinesiology at the University of Victoria and is author of Becoming Batman: The Possibility of a Superhero.